In Manassas, VA, you don’t have to replace a stained or damaged tub. With Miracle Method of Fairfax, your ceramic and fiberglass fixtures can enjoy new life for less money. Surface refinishing is an affordable way to give your bathroom or kitchen a clean, fresh look. We’re ready to help you save time and money on your renovation projects. We work with homeowners throughout the Manassas area, so give us a call today. We complete surface refinishing projects promptly, and we hope you’ll be pleased with the service at Miracle Method of Fairfax. We offer a fast and affordable way to transform and improve the fixtures throughout your home. Miracle Method of Fairfax services the Northern Virginia area from outside the beltway in Fairfax county to all of Loudoun county, Prince William, Fauquier and Stafford counties, and areas further out. We welcome the opportunity to improve the look of your bathroom, kitchen, or commercial space. Owners Brent and Laurie Redfearn will work with you to make the process rewarding. We love saving people time and money while getting rid of UGLY. That's what we do best! We are a Cardinal Shower door dealer, and can replace that shower door to complete the bathroom update! Come visit our beautiful showroom, where you can see and feel the difference in Miracle Method refinishing. We know you will be impressed with the quality of work we do. We invite you to visit our competitor's showrooms (if there are any) and compare what you get. With Miracle Method's attention to detail, you are sure to find a solution that pleases you. Do you know a senior who would benefit from a safer step-in tub? Miracle Method specializes in converting an existing tub to an Easy Step tub in less than a day. We will come to your location and show you what changes you can look forward to...while saving you time and money. 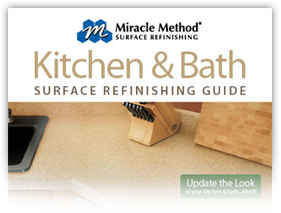 Miracle Method has set the standard for professional refinishing since 1979. Call today and let's get started! View our Interactive Consumer Guide for more information!